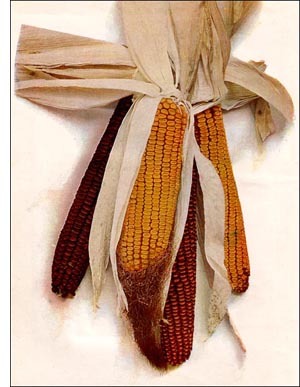 Maize, or Indian Corn, also known as Corn, is a plant belonging to the grass family. It usually attains a height of about seven feet, the single unbranched stem being jointed, only slightly tapering, with a central pith and an outer hard tissue to give necessary resistance to heavy winds. Each node (joint) has a single long, sword-like leaf, the lower portion of which encloses the stem (internode) like a sheath. The fruit, known as the " ear," is collective, several hundred individual fruits, usually designated as " kernels," being fastened to the spike, commonly known as the "cob." At the present time, corn is extensively cultivated in various countries, but nowhere on such an enormous scale as in the Mississippi Valley. The Mississippi corn region, with Springfield, Illinois, as its center, produces annually from 10,000 to 15,000 millions of bushels, or about threefourths of the total crop of the United States. In the Central States corn is cultivated on a large and simple scale, made possible by the rich soil. One man with four horses cultivates from eighty to one hundred acres, besides oats and other farm products. Corn requires rich, black, loose soil, with good surface drainage, and special climatic conditions. The season must be warm and nights must not be cool. With perhaps the one exception of rice, maize is the most extensively used grain in the world. In fact, all parts of the plant are used. The leaves form an excellent fodder for horses and cattle. The stalks also are used in paper making and in fertilizing the soil. The husk is used in mattresses. The most valuable part of the corn is the fruit, generally spoken of as the grain, or kernel. Green corn is highly relished as an article of diet, although its food value is certainly overestimated, as it is hard to digest. For this purpose sweet corn is preferred.